Really Upper Deck? Shame on you for not printing a card of University of Texas legend Jerry Sisemore. I guess they are saving him for series 2. Pathetic. 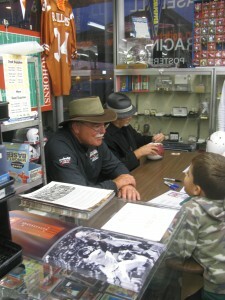 Well Jerry also appeared at the event and signed some cards. He was a last second booking, but I was happy to add him finally to the collection along with Bill Bradley, Johnny Walker, and Rod Babers. 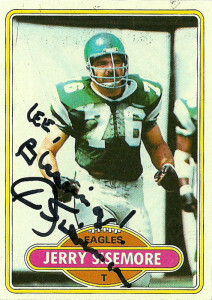 The 3rd overall pick of the 1974 draft by the Philadelphia Eagles, Jerry Sisemore was a man-mountain, at 6’4″, 250 after graduating from the University of Texas. He’d go on to start 155 games for the franchise over the next 12 seasons at both guard and tackle. 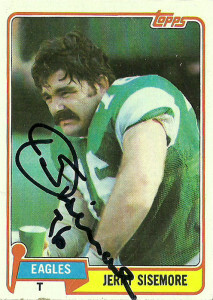 Sisemore played for an Eagles franchise from some of the lowest doldrums of the NFC East, to its apogee and the Super Bowl in 1980. In 1979 alone he played for a monstrous 430 minutes. Considered one of the Eagles finest linemen ever, he was inducted into the Eagles Wall of Honor in 1991 and the College Football Hall of Fame in 2002. Currently Sisemore partially owns a chain of sub shops in Austin called Delaware Subs, that used to air somewhat hilarious commercials where his Texas drawl and delivery were the punchline of them. He’s dabbled in coaching, lastly for the Florida Tuskers of the UFL. Jerry also is highly active in commercial property development, which if you live in Austin is quite lucrative. 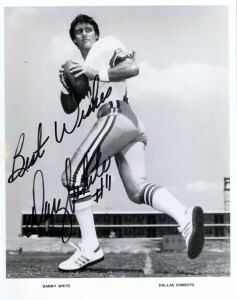 Danny White was originally a 3rd round pick of the Dallas Cowboys in 1974 (during the heyday of Tom Landry) after graduating from Arizona State but opted to play for the Memphis Southmen in the WFL. After winning All WFL honors after the season, he’d sign with the Cowboys in 1975 as backup to Roger Staubach and the team’s punter. When Staubach finally retired in 1980, White would have to be one of the many bearers of the Staubach legacy. He’d get in more trouble by siding with owners during the strike shortened 1984 season, finally culminating in a quarterback controversy with Gary Hogeboom. White would continuously battle back, posting a 62-30 record as a starter for the Cowboys during the 80s, but while the team was a perennial playoff contender through a great deal of the decade, fans typically remember only what you’ve done for them lately. An injury plagued 1988, coupled by the team’s woeful 3-13 record would lead to Tom Landry’s dismissal after Jerry Jones purchased the franchise. White would retire in 1989 shortly before the franchise drafted Troy Aikman to lead them into the Cowboys’ “Second Golden Age”. Danny White has never truly gotten his due, perhaps in part because he had to follow up Roger Staubach, or that his touchdown (5.3) to interception (4.3) were uncomfortably close. 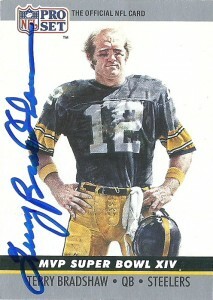 White also was only named to the Pro Bowl 1 year- in 1982 where he did double duty as starting quarterback and punter. Danny went right into coaching for the AFL with the Arizona Rattlers from 1992-2004, and the Utah Blaze from 2005-2008. His Rattlers would always contend for the title, winning Arena BowlVIII and XI and is currently involved in public speaking. His 141-65 record with the Rattlers is 2nd all-time in AFL history and he was inducted into the AFL HoF in 2002. Arizona would later honor him with the “Sportsman of the Century” award and in 1997 he was inducted into the College Football HoF.